Z – a mysterious and unknown world full of aliens, and you have to make your way through the various landscapes of this world. Each level has a box which contains a spacecraft for you to continue your journey to the next level, and you have to collect bombs and use them to blast one side of the box in order to access the waiting spacecraft. You can get bombs by shooting aliens; a capsule will come along and you have to shoot it to release the bomb, which will decompose if you don't collect it quickly enough. At the end of the day, it's just another run-of-the-mill space shoot-'em-up, and the game is rather boring; you spend more time trying to collect the bombs than shooting aliens. The scrolling is impressively fast, though. Who remembers Hungry Hungry Hippos from their childhood? Up to four players frantically bashed the levers on their hippos to try and eat as many of the marbles whizzing around the playing area as they could. It was fun and it was lunatic, but this computerised version of it just doesn't capture the magic of the original. 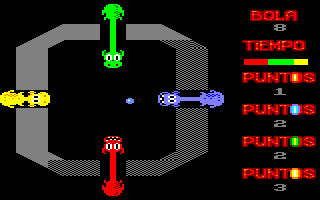 While the graphics are cute and colourful, only one ball is released into the playing area at a time. It's not possible for the computer to take control of any of the hippos, either. If you can find more than one person to play with you, then you might get some enjoyment from it, but it's unlikely. Ramses and Columbus are stuck in a Plus game cartridge (which shall remain nameless), and have to battle their way through 80 levels by zapping all the balls on each level, using a long spring which shoots into the air. However, there are platforms and ladders to negotiate, and neither of the two men can jump! 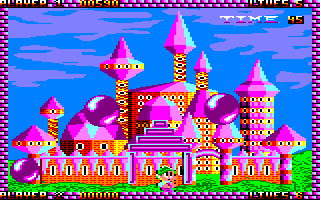 This game was talked about long after it was released, because of the fantastic graphics and programming techniques used; apparently the programmer was able to emulate Plus hardware sprites on a normal CPC. However, the fact remains that despite being one of the best-looking CPC games of all time, it is just a Pang clone with not quite as much gameplay. This is a cheap-looking horizontally scrolling space shoot-'em-up which really isn't up to much compared with similar games. 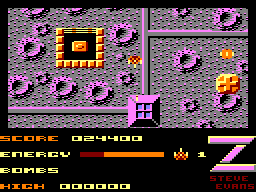 Aliens and meteors fly about the screen, and turrets fire a hail of bullets at you. Unfortunately, they're rather difficult to see, and you're faced with a combination of aliens and turrets all at once rather often. 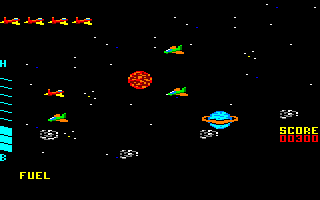 The graphics are colourful but rather simple, and the sound effects are pretty poor. As for the game, it's frustratingly difficult, especially since you're sent all the way back to the start of the level every time you lose one of your three lives. What sort of name is that? You'd think it was yet another space shoot-'em-up. Well, you would be wrong; it's a very disappointing platform game. On each screen, there are several beacons to collect, but you have to collect each beacon in a particular order. In addition, there are several aliens who will climb ladders and ropes to catch you, although you can shoot holes in the platforms to prevent them from doing this. However, they always try to take the shortest route to you, and evading them is often very difficult. The graphics and sound are both poor, and the game is just too tough to get anywhere. The ability to design your own levels doesn't add much, either. Zaxx is a clone of the isometric scrolling shoot-'em-up Zaxxon. Your spaceship flies over enemy terrain blasting defences, installations and alien craft. You also have to navigate your way through barriers, which is where your height above ground comes into play. You also have to keep a careful eye on your fuel reserves or you may suffer a crash landing. The game plays at a comfortable speed with a moderate level of difficulty. The scrolling is a tad jumpy in its movement but this doesn't spoil the fun. The graphics are very colourful, well defined and flicker free. Sound-wise, engine noises, blasts and bangs entertain your ears, which work well with the game. My only criticism is in how you have to be correctly lined up with your target in order to hit it. zblast SD is a ZX Spectrum game that was originally written for the 2003 Minigame Competition and converted to the CPC two years later. Firstly, I would like to say that I was pleasantly surprised by this 100% pure, old-fashioned shoot-'em-up. The graphics are basic and crude, but they move fast and smoothly. The introductory screen is very nice and reminds me of what the old game boxes looked like. The sound is good; there are sound effects and two fast-paced tunes. The gameplay is really good and it reminded me of the 2010 release Dead on Time. You really must be tough to get a good score! Overall, this is by all means a cool game and is not to be missed, especially for arcade fans. Despite its technical drawbacks, I have given it a high rating because of its playability. Load it and get ready to be zblasted! Deep within a labyrinthine ziggurat – a type of temple that is shaped like a pyramid – lies the fabled treasure of Tehotec, but many explorers have tried and failed to find it. Now it's your turn... This is an arcade adventure that is viewed from an isometric perspective. The ziggurat is vast and complex, and it is essential that you make a map, otherwise you'll become lost. To make things more difficult, Mimbies – the ghosts of previous explorers – roam the rooms. However, you can drop mice to lure them to a specific area of the room, or get rid of them by firing pebbles at them, but you will need to find a sling first! The graphics are well drawn, although the screen is rather bare, and there is some very good music on the menu. This is definitely a good game, but only if you've got the patience to map it thoroughly. 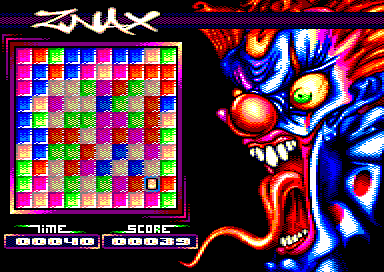 Znax is a puzzle game where you must match sets of four coloured tiles in a grid so they disappear. It is a smart idea that culminates in a not so easy game. The presentation is terrific; the graphics are really nice and brightly coloured with a good level of detail. A fantastic background is also present. The whole game is directly influenced by the demoscene. The sound is also great with a nice tune playing throughout the game. The gameplay is challenging and demanding; I have found it to be difficult for my taste. Overall, although I have a preference towards CPC puzzle games, this game truly deserves its high rating. Way back in the early 80s, there was a classic game called Qix, where you controlled a snake and had to create boxes which were then filled in. 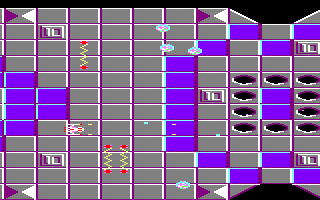 The aim was to fill as much of the screen as you could while avoiding some objects which bounced around the screen. The aim of this game is very similar – you have to fill 75% of the screen, but don't touch any of the bouncing dots! The game becomes harder by adding more dots on each level. It's not easy to explain, and it can be rather addictive, but it's too hard in my opinion.